The trapping of molecules in a rare gas matrix is simulated using an original method based on molecular dynamics calculations. 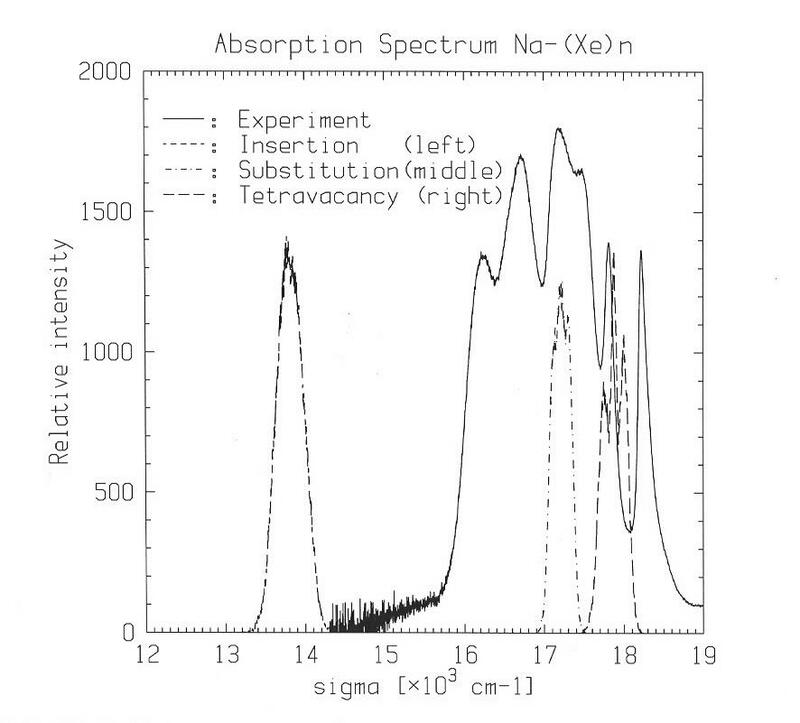 Absorption and excited spectra are also simulated. Isolation of atomic sodium in solid host xenon matrices: In collaboration with C. Crépin (LPPM, Orsay), J. G. McCaffrey and M. Ryan (NUI Maynooth, Ireland) a combined theoretical and experimental study is undertaken to characterise the isolation of atomic sodium in solid host xenon matrices. By molecular dynamics (MD) calculations we simulate both the deposition of sodium atom in the xenon matrix and the absorption and emission spectra. Results of deposition show that the sodium atom prefers to occupy a substitution site where only one atom of xenon was removed. Comparison between spectra obtained for different potentials shows the high sensitivity of the method to weak energy variations. MD calculations on the excited state surface allow to obtain the emission spectrum. We observed that whatever its initial site the sodium atom moves very rapidly to an interstitial site between two planes of the matrix where the emission occurs. This phenomenon should explain the only emission band observed experimentally.